Our Most Extravagant Evening Yet! A Formal “Mad Men” Night! Friday, October 19 | 7:00 p.m.
Join J. Henry & Sons Founders and Owners, Liz and Joe Henry, for an exquisite, formal dinner with lively and engaging company. “Mad Men” cocktail/evening attire is strongly encouraged! 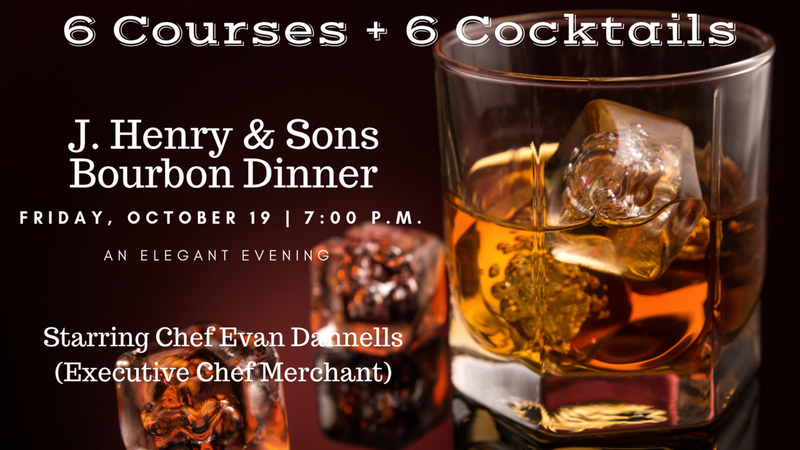 Merchant’s Executive Chef Evan Dannells, Sous Chef Edward Chwae, and our own Chef Jennifer Sawaya have crafted a magnificent menu. We are also collaborating with Merchant’s mixologists for the drinks. We are going all out for this event. Reserve your tickets early so you don’t miss out on this epic night. Click here to see the menu and make your reservation.